Building a leads list and learning the needs of customers, users, partners, and product developers are essential building blocks of effective business development. Aligning interests of these different stakeholders is often difficult, especially in the early stages of the product life cycle. This post examines how a business development executive (BDE) can facilitate key communications between users and product developers, resulting in better products delivered to market more quickly. A smart and creative BDEs who works to understand how the product meets the needs of users and its place in the ecosystem of potential partners, and who communicates with product developers consistently throughout the product development cycle, can help accelerate the development process and expand the product’s addressable market. By driving the process and establishing the standards for communication among the market facing teams and the R&D teams, a smart BDE can significantly enhance both the business and product development processes. Deep understanding of the user’s world and collaborations in understanding the unique pain points are directly related to successfully making deals. During an assignment that I undertook with Survival Inc. ™, I had the good fortune to play the unique role that combined the functions of business and product design and development. Survival Inc. ™ developed a Contaminant Air Processing System™ (CAPS™) to solve critical problems in decontaminating personnel exposed to nuclear, biological, or chemical (NBC) agents. CAPS is a compact, self-contained, mobile system that provides all necessary components required for efficient and safe cleaning of personnel wearing protective gear contaminated with NBC agents. 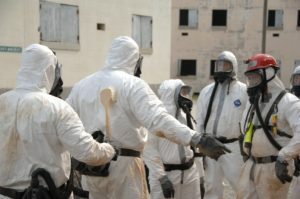 In a nutshell, CAPS is a comprehensive set of equipment and procedures, with associated training and operations support technologies, used for decontamination. Decontamination is a process that includes neutralization and containment of the contaminants and then providing a mechanism by which personnel can get out of contaminated gear quickly and efficiently, while minimizing the possibility of contaminating others. Sufficient flexibility to be adaptable to meet the specialized needs of diverse users (such as first responders, U.S. military personnel, medical and health specialists, hazardous materials (HAZMAT), and other emergency response teams). Overall standardization to ensure all organizations using CAPS can interoperate seamlessly when they are called to work together. As you can see below, by developing the suite of technologies incorporated in CAPS that address the common needs among various users but also allowed for flexible extension or expansion to meet the needs of specific subsets of users, we were able to secure a significant, long-term CAPS acquisition contract with the United States Air Force (USAF). First, we identified and met with representatives of all commands tasked with any aspect of personnel decontamination. Second, we obtained from each group lists of all equipment and procedures used to accomplish decontamination-related tasks. Third, we developed a comprehensive, cross-command matrix that illuminated substantial lack of standardization of both equipment and procedures. The existing protection systems of users consist either of fixed or transportable hardened shelters contain air systems with higher atmospheric pressure inside these shelters than the pressure outside (e.g., Chemically Hardened Air Transportable Hospital (CHATH)). The “over-pressurization” prevents potentially contaminated outside air from flowing into the hardened shelters. The hardened shelters provide a means for personnel to safely work without wearing protective gear. A common problem of these protection systems is that they are immobile. In many cases, the hardened shelters (such as a Military Army Surgical Hospital (MASH) units) were not available at all. The transportable variety, if available, had extremely limited workspace that could process only 10-15 personnel per hour. The USAF did not have standardized equipment or processes that met the mission requirements for decontaminating personnel. With no standardization, USAF personnel had to train groups separately on equipment, processes, and systems used by various groups. High training costs, inefficiencies, mistakes, and poor performance were common problems. Protective clothing and support gear used by any responder are heavy, bulky, and can cause severe heat stress even after short periods of wear. Heat stress begins to accumulate in mild or even cool conditions. Due to this, in hotter and humid climates, protective gear can be worn for only a very limited time before users face risk of succumbing to hyperthermia or heat-related illness. Moreover, the slower the decontamination process, the less time responders can remain in protective gear. In operations away from military bases, the utility of the existing decontamination equipment and systems was severely limited because, even if they were designed to be transportable, they were heavy and consumed unacceptably large amounts of valuable airlift cargo space. From this research, we developed an original prototype with core equipment and procedures to meet the basic needs of USAF air and ground crew. We tested the prototype during combat exercises at multiple military installations. CAPS met its objective of proving baseline performance capabilities and laid the foundation for an evolving set of capabilities that could increase processing speeds while reducing processing complexity. It was only through thorough and continued interactions with users (from different commands and in different functional areas), that we developed a solid and complete understanding of the nature of the problem faced by the users. Taking the results of our interactions and the feedback of the users to the research and development teams served us well in the company’s product development process. It was the business development skills however, that helped us create deep relationships with various stakeholders within the user’s environment. It was later in our actual sales and deal closure process that we realized the importance of the early and deep engagement with the user that helped us solidify our relationship that helped get CAPS technology adopted as a system-wide standard. This early work and relationship building also acted as the spadework that proved our competitive advantage in navigating through the internal political challenges within the user environment. CAPS remedied several problems that have hindered USAF in fielding an effective response to an NBC threat. Through the extensive interactions I had with USAF, we were able to understand the world of the users intimately, which helped us communicate efficiently with other potential users (e.g., Homeland Security and HAZMAT teams). This accelerated the RFP process because the pain points faced by the USAF were common to many other NBC agent threat responders. As a result of our interactions and the sophisticated R&D that went into developing the CAPs improved versions, the United States Air Force (USAF) selected CAPS as the core technology for use with their equipment and process for decontamination. Currently, USAF employs CAPS across Air Force installations in the US and overseas. During user tests CAPS proved that it could be installed and taken down in about 30 minutes (an hour faster than existing systems) and it could safely process 70+ people per hour (a 250%+ faster than the existing technology). As a result of the role I played and the work I did, I was awarded a Silver Medal by the Industrial Designers Society of America (IDSA), and 5 patents (4 for the decontamination system and 1 for novel shipping and storage system). CAPS today is effectively used by disaster response teams, medical response units, hospitals, HAZMAT crews, field engineers, fire control, security forces, and even by aircrews. By full engagement with user, including every essential component needed to set up a complete contaminant control area (CCA), and incorporating mobility, CAPS today can be viewed as a “CCA in a box”. Close collaborations between business and product development helps early engagement with customers and users resulting in important iterative refinements in a product. This helps generate sales much earlier in the product life cycle. Today, too few companies use deep interactions with users as a part of the product design and development process. All too often, the focus is on developing a “cool” product that product developers assume will fly off the shelves. Too frequently, the laborious work of actually talking to users and getting feedback is not done well or done at all. How many products you use everyday have a great user interface? In addition to identifying strategic business opportunities, BDEs can be important collaborators who can bring intimate knowledge of customer pain points that should be addressed by the product. Further, BDEs involvement goes far beyond the continuing interaction with users/customers spanning across all stages of design, prototyping, release, and refinements through later versions. BDEs with a diverse skills set can be effective partners in facilitating complex interactions, feedback, and market responses to a product. Moreover, BDEs with legal skills have the added advantage of being the mediators or negotiators between the senior management and customers in highly regulated industries such as defense, bio-med, pharmaceutical, life sciences, and finance, among others. At the end, it’s really all about the user. And since the user is usually the customer it makes great sense to consider the business development, pre-sale, and early engagement as integral parts of the product development process.